Asics’s marketing pitch: Features the Flytefoam technology for greater energy return between strides. Upper: Spacer mesh, fused synthetic, plastic external heel counter. Midsole: Flytefoam EVA foam, firmer medial post, rearfoot Gel pad insert. 10 mm heel to toe drop. Outsole: Hard carbon rubber under the heel, Dual-Stencil processed rubber lugs under the forefoot, plastic midfoot shank. Weight: 227 gms/ 8 Oz for a half pair of Men's US 9/UK 8/EUR 42.5/CM 27. Half trainer, half racer, the supportive Asics DS-Trainer has held its own over the past two decades. Now updated with a Flytefoam midsole, and an ounce lighter than before. 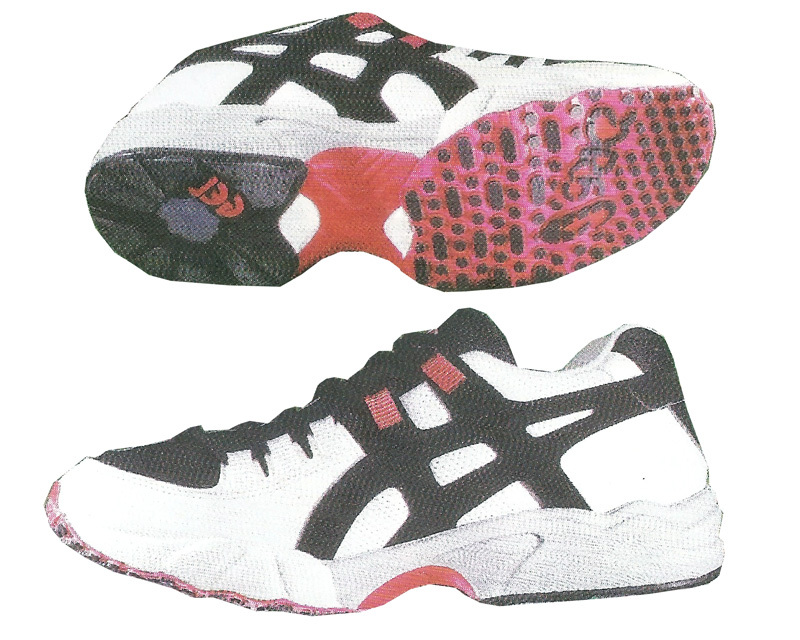 Launched in 1995, the Asics DS Trainer practically invented the light-support trainer category. Back then, the idea of a running shoe was putting together a giant foam stack with mesh and synthetic, and the size of the firmer medial post was internet-meme worthy. The DS Trainer changed that; it featured a lower profile midsole with an equally toned-down medial post. Not only that, it had a ‘Duosole’ forefoot which was pretty high tech for the mid-nineties. This was Asics lingo for a DSP (Dual Stencil Process) outsole, a design which sticks small rubber lugs over a fabric base. The 1996 Asics Gel-DS Trainer. The 1996 DS Trainer 2 also added a plastic shank (Trusstic) to the midsole, a feature which remains to this day. At the time, the DS Trainer cost a princely $100 when other trainers were in the $70-$90 price-range. Fast forward to 2017, and the DS Trainer 22 still lives with its core persona intact. As the running shoe industry evolved, the shoe has progressively slimmed down over the years. But if you look at the DST-22’s place within the overall category, it performs the same function as it did over twenty years ago. It is a lightweight and versatile trainer capable of taking on many roles, be it that of a daily road trainer or an instrument for speedy track intervals. It is also the only shoe in its class to retain the DSP forefoot, a feature which is often seen in racing flats. The DS Racer was also released at the same time as the DS Trainer, so the ’11’ suffix (DS-Racer 11) can be misleading. The Racer 11 is the lighter, racy version of the Trainer; a low-calorie version of the Trainer if you will. For 2017, the DS Trainer 22 gets a brand new midsole made of the Flytefoam material. 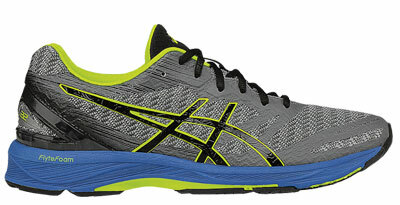 Asics’ new midsole compound made its debut on the $250 Metarun, followed by the Dynaflyte and the Kayano 23. This update affects the 22’s ride quality versus the 21, and the upper receives a few minor tweaks. The medial post design is similar to the DST-21 and offers midsole support without being intrusive in nature. 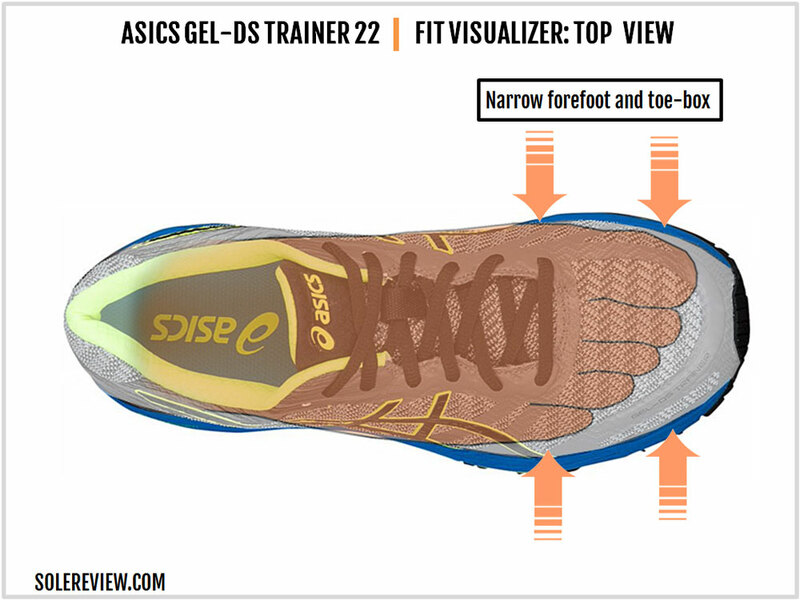 The DS Trainer 22 follows the same upper design template as the 21. The entire external layering is heat-fused over a spacer mesh base, resulting in a clean visual profile. The toe-box is shaped by an internal stiffener, and the outside is protected by a layer of fused laminate. Only the outer midfoot has some additional structure provided by the molded Asics logo; the inner midfoot has a thinner logo which blends in the rest of the scenery. The heel is reinforced with an external plastic clip, a treatment which is similar to the last model. There are windows cut into its sides, and there’s a reflective trim for night-time use. The DST-22 goes easy on the synthetic layering near the Achilles dip. Whereas the DST-21 used a thick band of synthetic near the top, the 22’s upper heel is nearly all mesh with some fused layering. As a result, the Achilles dip is softer than last year but doesn’t curve inwards as much as the DST-21 did. The tongue and heel lining is the same as what was on the DST-21. The fabric is soft and padded with foam around the heel; on the other hand, the tongue is pretty thin. There’s no sleeve, so the tongue tends to move around a bit. The highlight of the latest DS Trainer is the new Flytefoam midsole. A few years ago, Asics teased the new midsole material in the ridiculously overpriced Metarun. 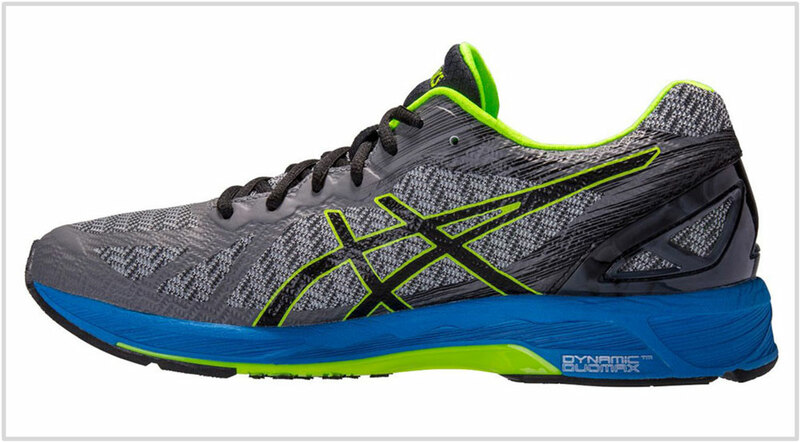 Soon after, Asics used Flytefoam in the all-new Dynaflyte, followed by the Kayano 23. If the recent trend is any indication, Flytefoam is soon going to be ubiquitous throughout the Asics line. A quick primer on the Flytefoam will be helpful, we think. The new midsole material is EVA foam blended with fibers; when examined closely, the foam does have a shriveled texture with strands of yarn visible on the surface. 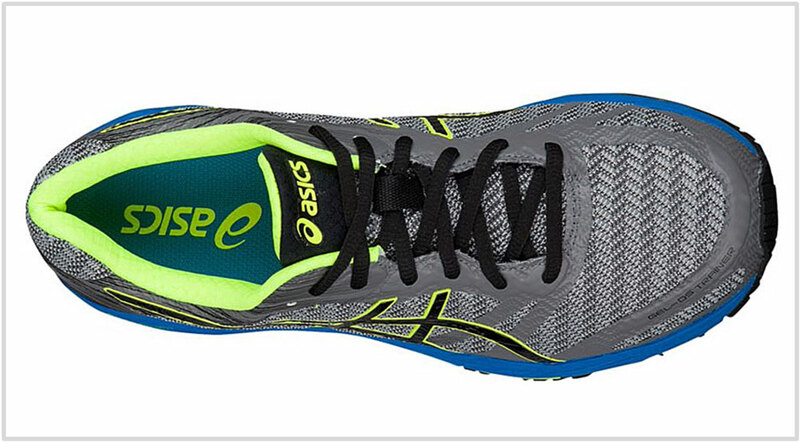 Asics claims that this foam blend reduces weight and increases responsiveness. The lightweight claim seems to be legit because the DS Trainer 22 is an ounce lighter than the 21. 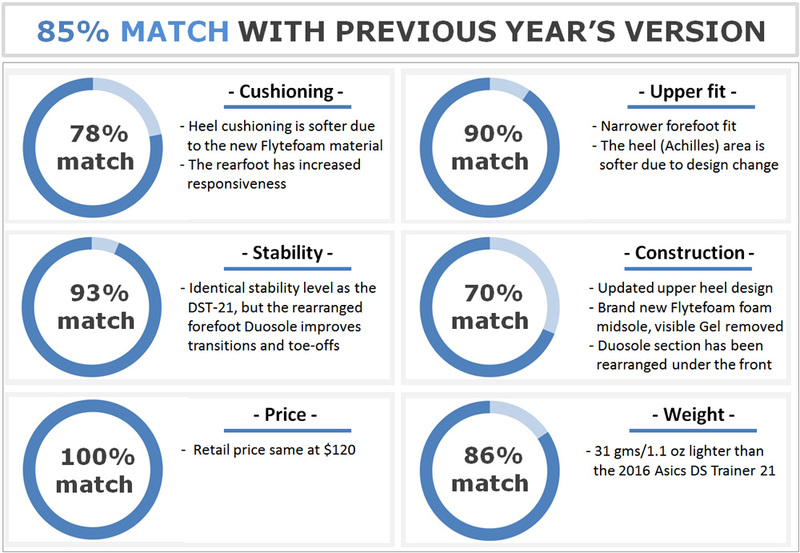 Considering that there’s no apparent material cut-back on the upper and the outsole, the weight savings appears to be produced by the new Flytefoam compound. It is slightly softer than the standard EVA foam used on the DST-21, so that gives the DST-22 an edge in cushioning softness. Though the Flytefoam isn’t in the same league as the adidas Boost or the Saucony Everun, the ride experience is more engaging than the DST-21. The midsole design of the new model is standard DS-Trainer, which means that the inner midsole has a small and firm foam wedge. Unlike full-blown stability shoes, the DST-22 has a medial post (Duomax) which is short in height and tapers gently towards the forefoot. The medial post is also limited to the lower part which means the midsole edge under the arch is made of soft foam. This arrangement of the medial post is similar to the DST-21, including the tone-on-tone integration with the rest of the midsole. The outer midsole has a flat profile and does not have the strip of visible Gel seen on the 21. 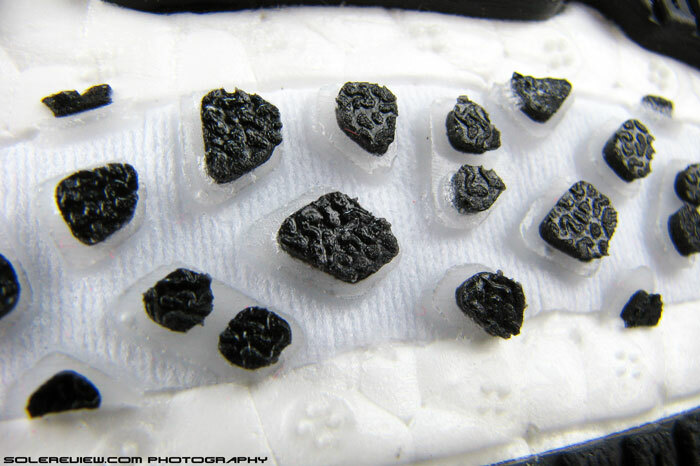 We always suspected that the Gel strip on the 21’s midsole was merely decorative, so no harm done. 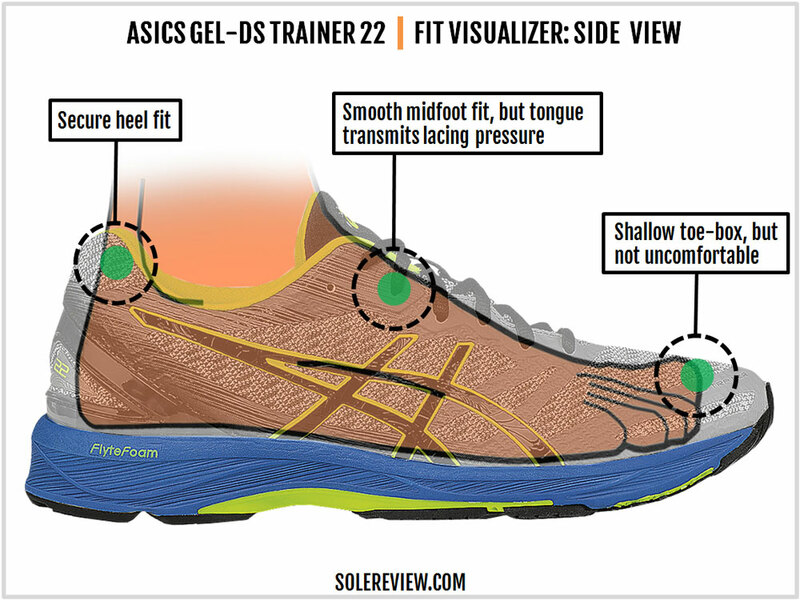 The outsole has the tried-and-tested DS-Trainer layout. In other words, the rearfoot has pieces of hard rubber flanking an area of exposed foam, and the forefoot has the DSP (Duosole) construction. The midfoot is bridged with a huge plastic shank which not only spans the waist but extends forward under the forefoot. Other regular design features are included, such as a heel crash pad separated by a groove, and the ‘Guidance line’ which extends from the heel to toe. The same applies to the molded insole made of a soft open-celled foam and the foam lasting underneath the latter. All that said, the DST-22’s outsole has a very important update over the 21. The DSP outsole portion (the area with the small lugs) has been rearranged. Instead of concentrating it in the center (like the last year), the DSP Duosole rubber is re-positioned along the motion path. Besides offering superb grip over all surfaces, this redesign makes a significant impact on the transition quality. 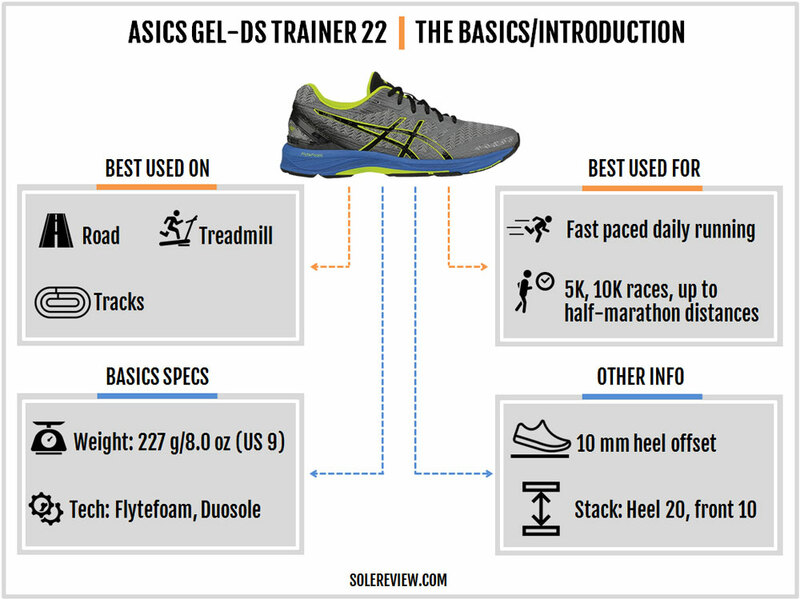 Asics has been using the Dual Stencil Process (DSP) based Duosole on the DS-Trainer over the last twenty years, so it’s as tried and tested as it gets. We’ve rarely come across cases where the small lugs on the fabric base have failed in the early stages of ownership. At the same time, you cannot expect regular trainer-like durability levels from the DST-22, so 300 miles is what you should get. 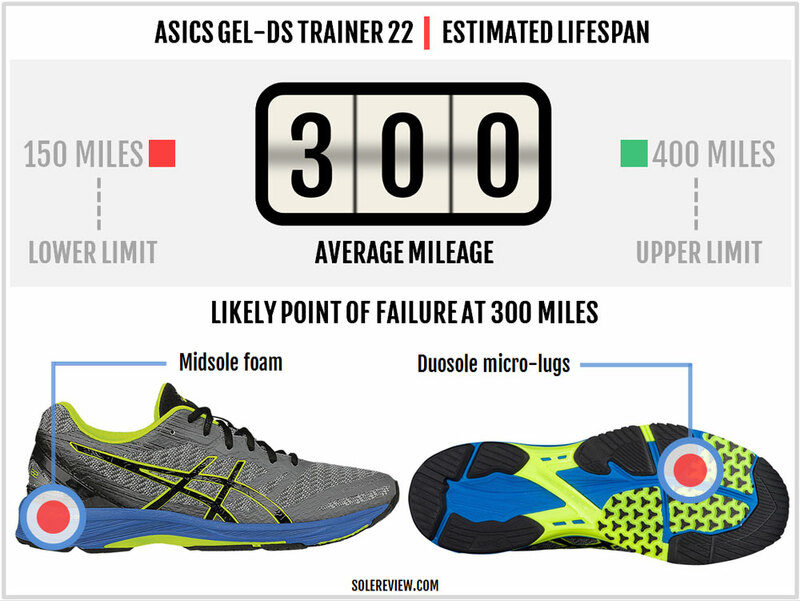 The Flytefoam midsole should last longer than the regular EVA foam which Asics had been using so far. The DS-Trainer does not have a spacious interior. The toe-box is shallow, which is in line with the rest of the snug fitting upper. There’s no sleeve attaching the tongue to the upper, so the tongue tends to move during runs. The thinly padded tongue also transmits a noticeable amount of lacing pressure. Inside, the upper has a smooth fit, thanks to the liberal use of fused layering on the shoe’s exterior. The heel has a secure hold. The combination of the soft fabric, foam fill, and the outer plastic counter helps lock-down the heel, though some runners might find the large heel clip to be slightly intrusive. The DS-Trainer 22 has a very narrow forefoot. This isn’t necessarily a bad thing because a narrow forefoot fit is beneficial for short and fast workouts like track runs. As far as forefoot strikers are concerned, the DST feels like a racing flat as the snug upper perfectly complements the grippy Duosole outsole below. But if you’re going to use the DS-Trainer 22 for a half-marathon or even 10K runs, then it’s better to go a half size over. Soft isn’t the word you’d use to describe the DST. The forefoot is decidedly firm due to the thin midsole stack and the Duosole outsole. That said, the heel possesses a certain degree of softness due to a variety of factors. The Flytefoam midsole has a softer feel than the previous generation EVA midsole used on the DST-21. The blown foam insole contributes to the cushioning feel, and so does the area of exposed foam on the rearfoot outsole. 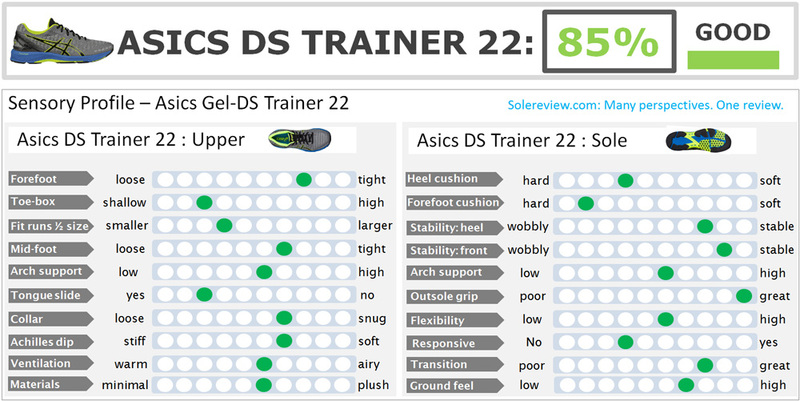 Needless to say, the DS-Trainer 22’s cushioning softness is skewed towards the rearfoot. It’s like a racer in the front and a regular trainer in the back. One of the things we like about the DS Trainer is that the midsole edge above the medial post isn’t firm. The firmer density wedge is confined to the lower regions, so the upper midsole edge is made of softer Flytefoam. The Flytefoam isn’t particularly bouncy, but you do get some good feedback from the rearfoot. On a relative scale, the Flytefoam compound feels more responsive than what Asics has used historically. The forefoot does not have a springy feel but instead delivers excellent feedback. 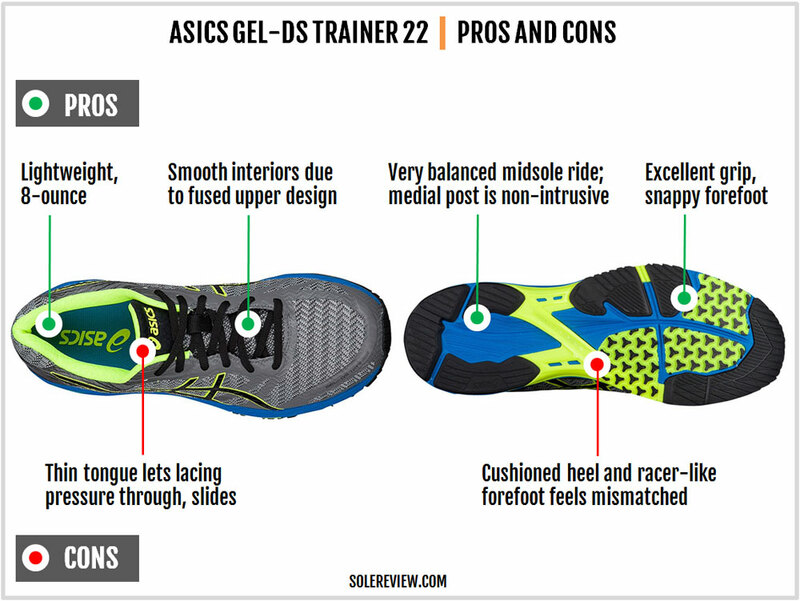 Much of the forefoot’s feedback quality has to do with the extension of Asics’ Trusstic shank. The sides extend right under the forefoot, and this delivers a snappy feel which feels great during transitions. The firmer medial post notwithstanding, the DST is a very supportive shoe. The midsole design on both sides is fairly balanced and the foam is fairly firm, so there’s no noticeable compression bias. The guidance groove running along the shoe’s length keeps the foot centered. The grippy Duosole section (small lugs on fabric) has been rearranged to mimic the motion path, so transitions are of a better quality than the DS-21. You get the superlative grip quality beginning from the inner forefoot to the outer side, a design which produces efficient push-offs. The DS-Trainer 22’s newly acquired 8-ounce weight is pretty lightweight when you consider the amount of rearfoot cushioning and the outsole rubber. The DST-21 was light enough, but the 22 goes a step further. On the flip side, the significant difference between the heel and forefoot heights makes the DS-Trainer 22 rear-loaded. If you’re a rearfoot striker, the DST-22 comes across as a well-padded trainer. If you land on the forefoot, the DST-22 doesn’t feel very different from a racing shoe. 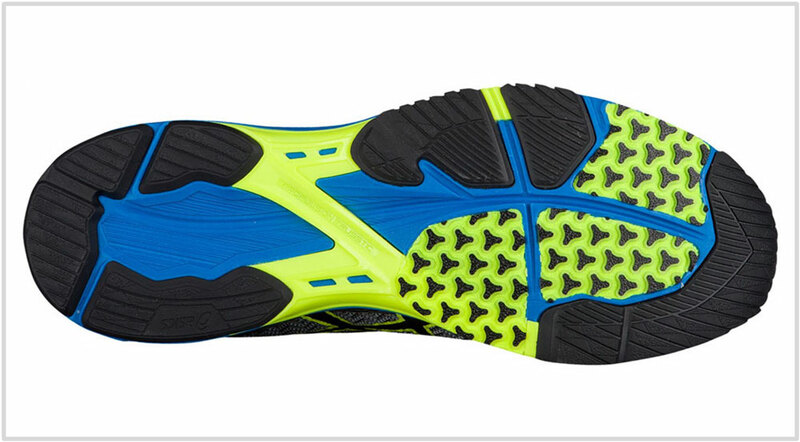 The forefoot has amazing grip and transition quality, but the ride quality is Spartan. 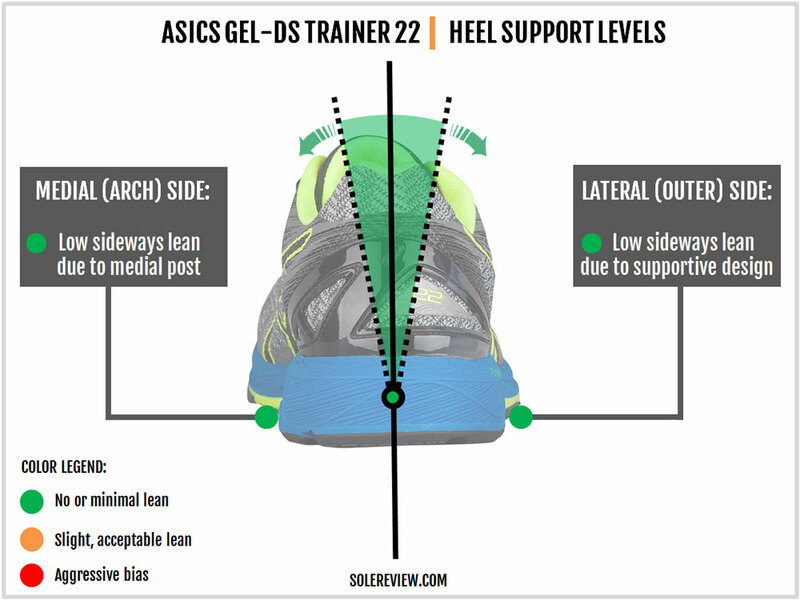 Guess this holds true for most running shoes with a higher heel drop, but the DST’s lower stack heights make it more obvious than what it needs to be. 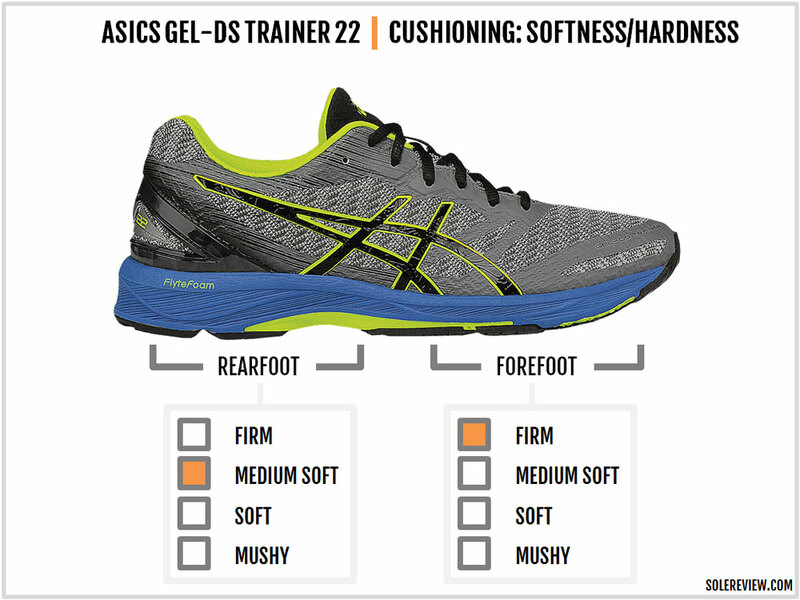 The tongue could do with a little more padding, and Asics should offer at least a 2E (Wide) width as an option. There are two changes on the upper worth highlighting. The forefoot fits slightly narrower due to the updated design, and the reduced usage of synthetic layering (on the outside) makes the Achilles dip on the heel softer. The DS Trainer 22 receives a major update (and upgrade) in the form of the Flytefoam midsole. Not only does the shoe weigh an ounce less than the 21, but the ride also becomes softer and more responsive. The DSP forefoot layout is also tweaked, resulting in a better transition along the motion path and hence an improved toe-off quality. Other that these updates, the DS-Trainer 22 feels a familiar shoe to run in. The fused overlays result in a smooth interior, and the extended plastic shank feels quick and snappy. At an MSRP of $120, there’s no change in the retail price. 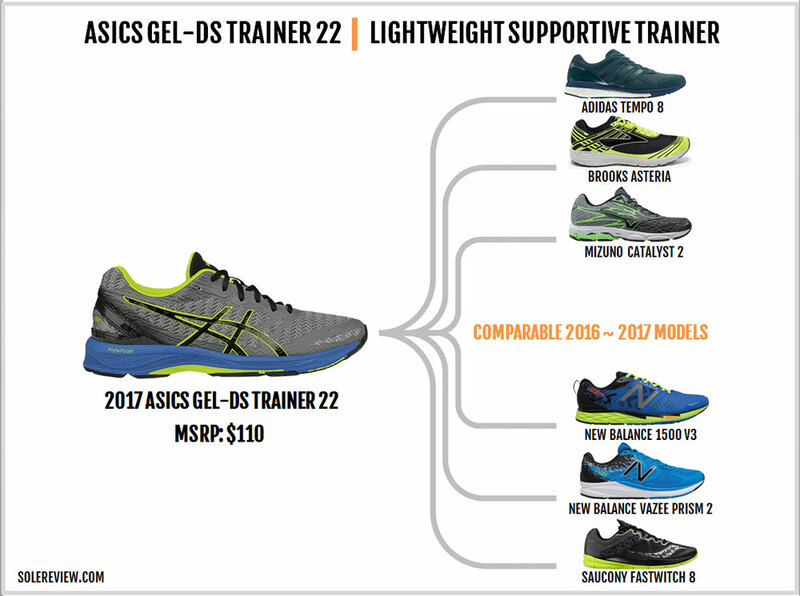 In Asics, you’re spoiled for choice when it comes to shoes with a firmer medial post. No matter what the price or sub-category, a medially-posted running shoe is never far away. The DS Trainer 22 might not cut for long runs – say, a marathon – so it makes sense to get a second shoe with more cushioning. The Asics GT-2000 5 offers that while featuring a non-invasive medial wedge. And why not the cheaper GT-1000 5 instead of the 2000? That’s because the GT-1000 feels built to a price, and the GT-2000 is much better value. On the other hand, the Asics DS Racer 11 works best for shorter races of 5k and 10k. As a slimmed-down version of the DST-22, the Racer 11 complements the latter perfectly. The Nike Zoom Span is somewhat similar to the DST in the sense that it has a small and sloped medial wedge. That similarity aside, the Zoom Span packs more cushioning and responsiveness than the DST. This makes the Span a good rotational companion to the DS Trainer. If you think getting both the DS Trainer and Racer to be overkill, then consider the Saucony Fastwitch 8 as your shoe for shorter races. While the Fastwitch lacks the tenacious grip of the DS-Racer’s Duosole, its lightweight build, firm ride, and the snug upper makes it a good shoe for fast runs. A few years ago, the DS Trainer was one of the few of its kind. After all, there weren’t many lightweight trainers with a firmer medial post. But today, the market is crowded with alternatives. Let’s run through some of the similar models out there. 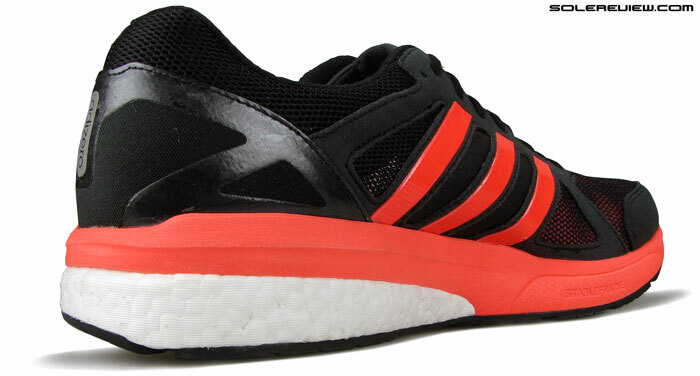 The adidas adizero Tempo 8 is a popular model within this category. The midsole is made out of the bouncy Boost foam, and midsole support is provided on the medial side by adidas’s ‘Stableframe’ design. New Balance has two models which compare to the DST. The 1500 V3 comes pretty close in form and function, combining a pint-sized medial post within a cushioned yet lightweight midsole build. The Vazee Prism V2 is also worth a look. The Mizuno Wave Catalyst 2 is the stability version of the popular Sayonara, but when Mizuno mentions ‘stability’, you have to take that with a large grain of salt. Like other Mizunos, the Catalyst does not use a firmer wedge plate but instead features a variation of the Wave plate. Regardless of what other brands offer in this running shoe category, the Asics DS-Trainer is adequately differentiated. No other shoe in this class features a DSP forefoot outsole. 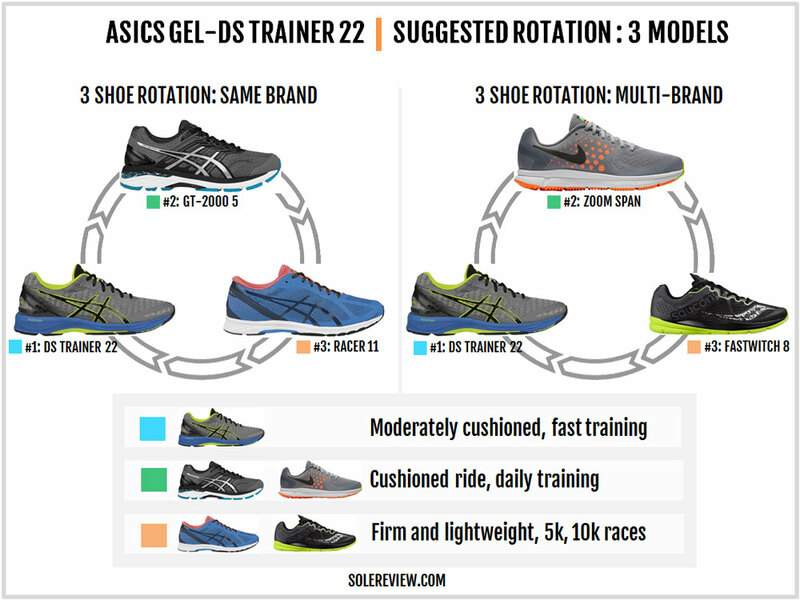 The colony of micro-lugs spread over a fabric base not only gives the DS-Trainer a far better grip quality than the rest, but also makes the DST a superior track workout shoe.